A wise man once told me that "Leaders are readers." I don't think I understood it as much the day I heard it as I do today. But it is true. Want to be a leader? Read. We've just got to read and read widely. Lots of genres, lots of books. That's the thing about wisdom and leadership...you never know what you're going to need to know. You never know what new ideas you're going to need to learn. You just need to learn widely and learn often. And it's not hard to read books. Three years ago, I discovered audio books. I re-purposed my commute time in the car and have since read 78 books in my car. Classics, young adult, leadership, economics, marriage, the Bible. 78 books just during my driving time. And I only commute 1 hour a day. I've been able to recommend so many books to reluctant readers because I've read them. A student can tell me a book they enjoyed reading, and I can now give them 4 or 5 new options that they might enjoy and they aren't just books I read when I was a kid. It keeps me current. It gives me credibility. And it's one of those small things that helps with classroom management. Street cred (or book cred) improves your classroom management one student at a time. So what books are you going to read in 2014, teacher, leader? If you're a teacher, you have about 180 days you will drive to teach. If you've got 1 hour a day (1/2 hour each way), that equals 180 potential hours of reading. Many books you could knock out in 4-5 hours. Many more in 10-12. So let's get on it...and get leading. What strategies do you use to read more? The other day in class, we were talking about the importance of goal-setting and, more specifically, the power of writing them down and telling them to people you love. Well, one of my 7th graders made a goal for herself to be able to type 50 wpm this year. She's at 35 now. Oh, and she found this free online typing website all by herself and tipped me off to it. It's pretty fantastic!!! I'm at 60 words per minute. What are you at? 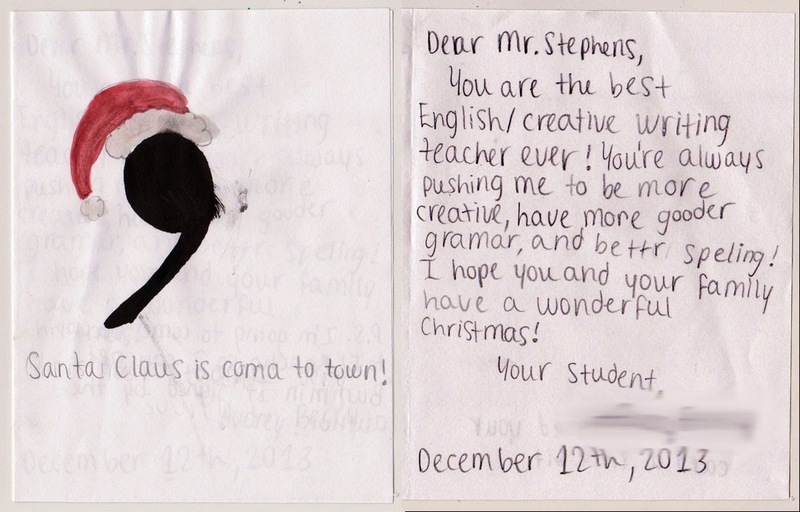 In more than a decade teaching, only rarely have I gotten glimpses into the impact my teaching is having on my students. Sure, I see them master content and score well on tests. I see their faces light up with what I'm pretty sure is understanding and learning. But clear evidence of my impact feels elusive, oh so far-and-few-between. 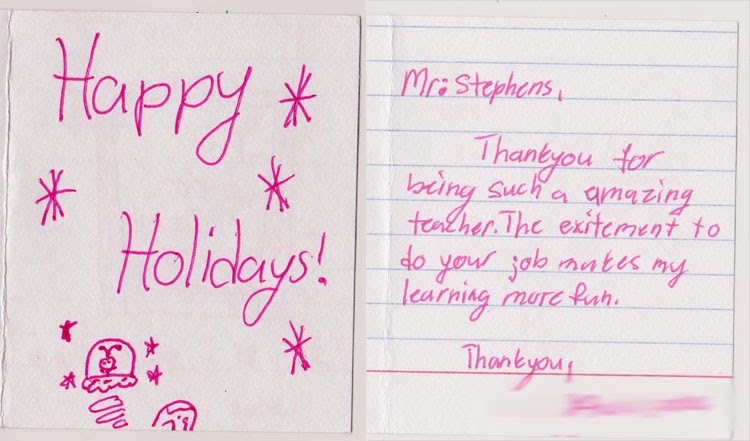 You teach 220 middle-school students all year and hope you're guiding their young minds toward adulthood. You toss seeds of wisdom out into the air over their heads and hope it settles on the soft soil in their minds. And every once in a long while, you get reassurances that what you are doing is making a difference, that all your efforts to teach beyond the Common Core test-able knowledge is making headway, that you're passing on what's ever more important than the content. 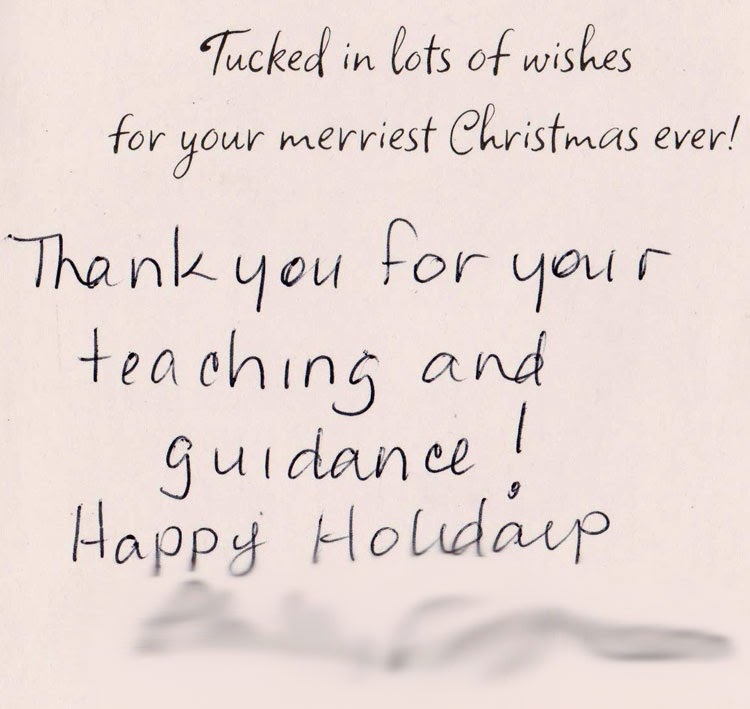 So I thought I'd share some Christmas cards parents and students wrote me this year, and while these were written to me, I believe most of you teachers out there can take these positive words and know that they too apply to you, whether or not your students wrote them down in a card. You are the type of teacher who will continue to live on in students minds long after they've left your class. The way you encourage these kids to rely on their own minds and think outside of the box is a priceless gift. Londyn is a very young minded 12 yr. old (which we embrace) but we are thrilled to see her questioning, seeking out truth, and celebrating her individuality. We can't thank you enough for continuing to inspire, and teach with all your heart! Londyn is so fortunate to have you. Enjoy the holidays with your beautiful family. Thank you for being such a amazing teacher. The exitement to do your job makes my learning more fun. Thank you. Ryan sometimes shares your wisdom on life and so many times he has said, "It's exactly what you guys tell me!" As well as being a great English teacher, it's absolutely refreshing to know you are guiding our young ones in the right path! 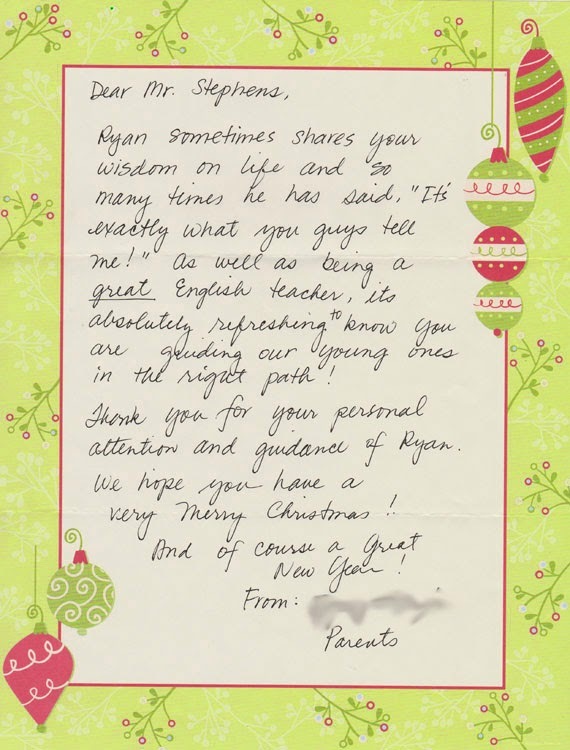 Thank you for your personal attention and guidance of Ryan. We hope you have a very merry Christmas! And of course a great new year! Thank you for your teaching and guidance! Happy Holidays. You are doing well. What you are doing matters. It is okay to teach more than the standards. Students are watching. You are making a difference in lives, more than you know and more than you'll likely ever hear. Teach on!